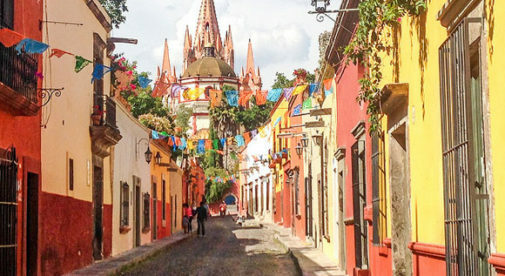 It’s the middle of “high season” in San Miguel de Allende right now. The expat population of this colonial city in central Mexico swells from January to April as retirees flee winter weather in the U.S. and Canada. There can certainly be some cold nights here, but with daytime temperatures in the 60s and 70s F throughout the year, it’s a pleasant retreat in any season. It’s the perfect weather for relaxing with an espresso or glass of wine at a sidewalk café…or enjoying a meal in a courtyard restaurant. A favorite meeting spot is the main square in the colonial centro, the meticulously kept Jardin. There you’ll find expats and locals, of all ages, relaxing in the shade on wrought iron benches, chatting with friends, snuggling with a sweetheart, or watching the children play. The iconic pink stone, gothic-style bell tower of the Parroquia church looms above all. Of course, climate isn’t the only reason folks make the journey south to this historic city. The many other benefits it offers make it an ideal destination for part-time or full-time expats any time of year. For one, you’re living in history in San Miguel. Founded in the 16th century, you’ll find buildings from back then, to present day in town. Starting in the Jardin, you can stroll down narrow cobblestoned streets in any direction. Thanks to a lack of signage (due to historic preservation regulations), you never know what you might find when you walk into an open doorway or courtyard…or turn a corner. Your favorite café, the corner store, your bank, a chic boutique…all could be housed in buildings centuries old, rehabbed and repurposed as needed. Some expats do live in restored colonial homes or colonial-style homes as well. But to be in the middle of the action in centro can be quite pricey. That’s a legacy of its popularity with well-heeled foreigners, as well as Mexicans from the country’s big cities who flock here. But there are still bargains if you look closely. A two-bedroom condo a five-minute walk from the Jardin is listed now at $249,000—it comes fully-furnished. For rent, you have options as well, although centro has the highest prices. One two-bedroom home rents fully-furnished for $1,400 a month. Many expats buy just outside centro in neighborhoods (called colonias) like San Antonio or Independencia, where they can walk, bus, or taxi in to the heart of the historic district. One three-bedroom home in San Antonio—one of the most popular and cost-effective neighborhoods with expats—is available now for $185,000. It takes about 15 minutes to walk into centro. A similar distance to downtown is a two-bedroom home in Independencia for $167,000. Also, in San Antonio is a furnished long-term rental—a one-bedroom casita with rooftop deck, going for $680 a month, including utilities. As far as expats go, San Miguel first got on the radar just after World War II, when veterans found they could use the GI Bill to study art (and live well on little money) at local institutes. That heritage lives on to this day. Talented expats and locals have opened art galleries all over, including in the vast Fabrica La Aurora, a former textile factory on the edge of town. But you don’t have to be working artists to get in on the fun. There are classes in painting, sculpture, metalwork, photography…just about anything you can think of. If you’re a collector, you have the modern works, as well as plenty of shops specializing in traditional Mexican folk art. There is a lot going on in San Miguel. And with the many parades, celebrations, and other festivities the in-city neighborhoods can be quite boisterous at times. If you’d prefer to live in quieter surroundings there are modern home and condo developments just outside town. One condo building, in a mixed development with shops and a boutique hotel, features recently built two-bedroom units, going for $207,000. Another popular outside neighborhood is Los Frailes, which feature large homes with yards and gardens—a rarity in town. A five-bedroom home here, listed now at $238,000, could easily be turned into a B&B. A two-bedroom home in the same neighborhood is $169,000.